I can't wait to see everyone else's! Oh aren't these lovely and colourful...your lamp is particularly nice, I have never seen one like that before. Great roosters! I love the quilt star rooster the bestest! I am a quilter too, so I'm glad I found you! The quilts on your sidebar are beautiful. 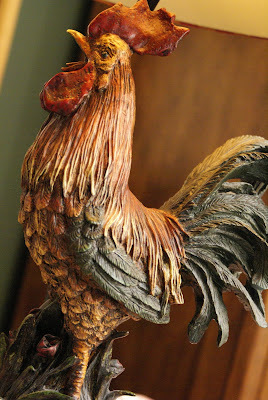 I think my favorite rooster is the Jim Shore one. I love the colors. Your quilts are stunning as are your roosters. I'm so glad I found your blog through this party. 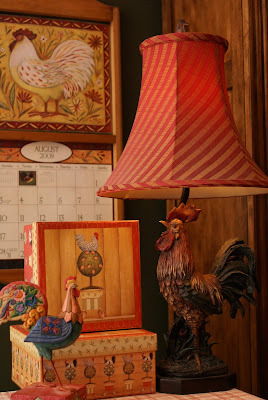 Hi Dorothy, your roosters are stunning...the lamp is to die for. Just gorgeous! Thanks for joining the party and sharing your friends with us. Loved your roosters, but my eye was drawn to your beautiful quits and sewing room....man, I hope someday I can create a quilt as lovely as yours. I just finished (well almost) my first quilt..but I have a long way to go. Have a great weekend. Ohhh, I loved your roosters. I think I liked the lamp best, but it's hard to choose a favorite. They're all gorgeous. 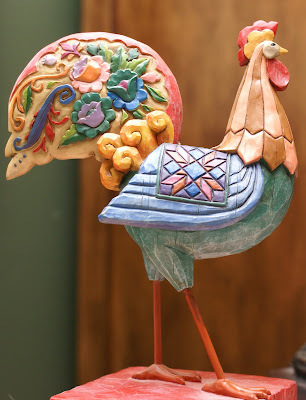 Happy Rooster Day, have a great weekend. Love your roosters! Loved the party. Sorry I'm a bit late, I'm still working my way though the list of rooster parties. Enjoyed your post. I like the quilted rooster! Thanks for sharing! I'm also slowly getting to the rooster parties! Wonderful roosters! ...and love your very beautiful quilts!!! oh your sewing room is absolutely wonderful! I've had a little hexagon and also a little cathedral quilt that I started years ago!...I really need to work on them, so that maybe it will be done for our first grandbabies. My mom, on the other hand, was a wonderful and quick quilter! I'm so thankful that each our our 3 have one of her quilts that she made before she passed away.